Have you ever had a song that you can’t find on itunes and you really want to get it? I have, and this is the way I figured out how to do it for free! A friend of mine introduced me to this website and I think that it is really cool. 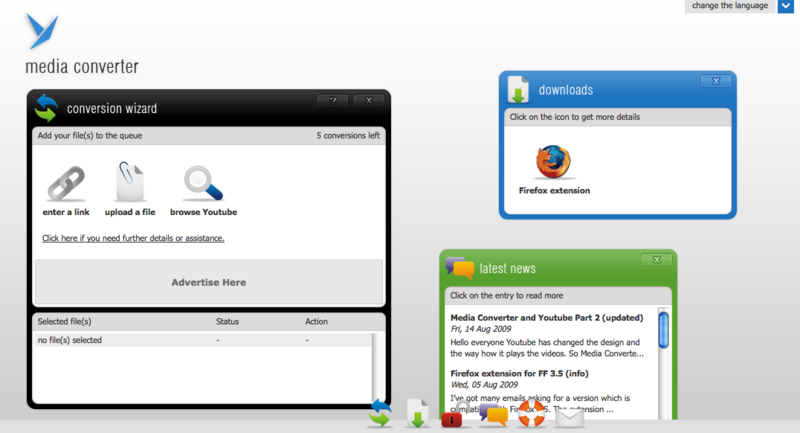 so the website itself is http://www.mediaconverter.org and this is how I have been using it. First of all this website as far as I can tell is open to anyone and you don’t even have to sign up or give any information. The purpose of this website, or what I have been using it for is to rip the audio track off a video (I use Youtube) and then be able to transfer it to your ipod or musical device. So, this is how you do it (keep in mind there might be easier ways to do this but this is what has worked for me) When you go to the website on the home page there is a box in the middle of the page that’s called the conversion wizard. Click the “enter a link button” and then copy and paste a link from a video of which you want the song and then hit “ok” Now the screen should look a lot like it did when you started but now on the far right there is a green arrow that says “go to the next step” click on it. Now it’s going to ask you what output file type you would like select mp3 there are a lot of options here and you could probably play around with it and get it to do something else if you wanted to but I haven’t gone as far to do that yet. So, hit ok and now it should say that there is one file in the queue, hit “start” now there should be a loading bar on the lower half of the page telling you how far along it is. Once that is finished loading then a link should appear that says download, click on that. A screen should pop up asking you what program you want to open it with, this works with itunes however it does have a few quirks. The song title will be whatever the title of the video was and you can’t change it. Also, I have found that once you exit Media Converter that the song becomes unplayable. My suggestion is to put it on your ipod while you still have the site open. This may seem like a hassle but it does work and if you really want a song it is free! One more thing, you might notice that at the top of the box on the home screen it tells you that you have a certain number of conversions left I have been using this for a while and I have never run out**. I also tend to only download one song at a time so maybe if you download say five songs in a short span of time it will make you wait a while before you can download any more. I hope this is helpful to people and if you have any questions I will try and answer them. Thanks! **The counter lets you know how many conversions you can do in a day. If you’ve got a free account, which is what we are all about, then you get five conversions per day. But! Don’t let that fool you, you can get five conversions a day, which should work just fine. If dealing with that restriction isn’t for you, check out the cash-money version. The “pro” isn’t too expensive, but I like it free.